This clear plastic parasol is durable and is perfect for the show “Singin’ in the Rain”. 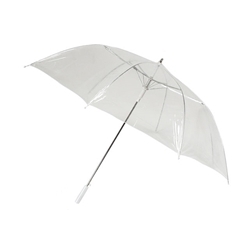 The parasol features a white handle with a clear plastic covering. This parasol can also be used as an umbrella. The clear parasols measure 31” in length and a diameter of 25”.